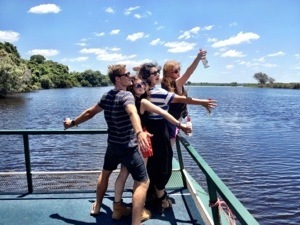 After the rest of our group visited the falls, we headed over to Botswana for a whirlwind tour of Chobe National Park. By noon we were already on the river. The Chobe river separates Botswana and Namibia (Yes, I needed a second look at a map to figure out why Namibia stretched that far east), and we cruised down the border line for a good couple hours. Our boat driver, Cherry, was this super smiley Setswanan man who was very excited to point out all the animals in the national park. 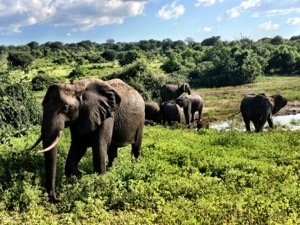 And it wasn’t long before we came across a herd of elephants playing right along side us in the river. 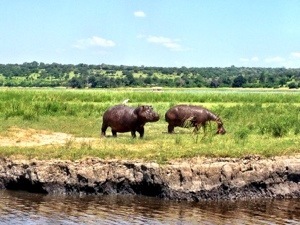 There weren’t a huge variety of animals in the river, but we saw lots of elephants, crocodiles, buffalo and hippos. We managed to pull up right next to one herd of hippos, bathing in the river, that actually swam up and hit our boat from beneath so as to mark their territory. 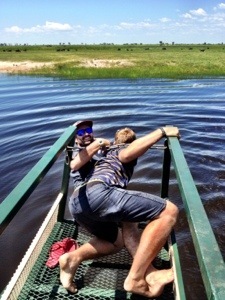 Attacked by a hippo: check! The boys, who are not following us for the second half of the tour, spent a significant amount of time trying to “reach Namibia”. Although Vin Diesel wasn’t there this time to “officially” mark it on their passports, Nick still claims that throwing chunks of ice at the country counts as being there. Whatever helps you sleep at night, Nick. Immediately after the river tour, we hopped on an open-aired truck and began our game drive through the National Park. 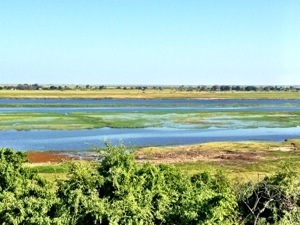 Chobe National Park is home to between 65 and 70 thousand elephants… And believe me, we saw A LOT of them. In herds, alone, old ones, young ones, they were everywhere! 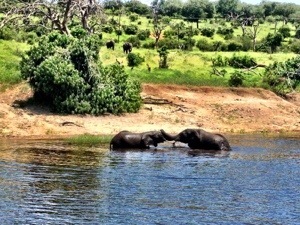 If you want to see an elephant in Africa, Chobe is the place. There were lots of different animals in the park by late afternoon. 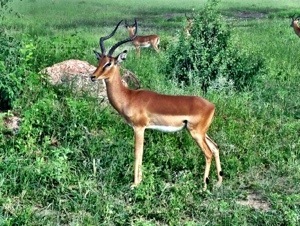 We came across herds of impalas, a bunch of warthogs, buffalo, bird species, and giraffes. 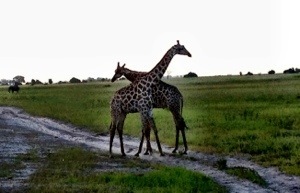 At the end of our game drive we stumbled upon six giraffes coupled in twos. They were amazing to watch. The couples fought each other, then looked as if they were dancing together, and then just stood with their necks against each other in a strange, but loving, giraffe embrace. That night, we slept out in the wild. Our camp was already nicely set up for us when we arrived at dinnertime. Two ATC groups were staying in the same area and we all got the rules for the evening as we sat around the camp fire. Pretty much the same lecture as the Serengeti: go to the bathroom in groups, stay quiet and keep your tent dark, watch out for wild animals, and if you run into a lion or an elephant, don’t scream! We did pretty much everything against the book that night. We sat in our tents, laughing at stories well into the evening, torches on, eating chocolate… So obedient. Outside our tent we could hear the trumpeting of elephants and rustling of trees. We were definitely out in the wilderness! Kelsi even said, as she was brushing her teeth in the dark the next morning, she could see literally hundreds of eyes in the bushes around her just staring back. As we started our morning game drive it was clear that this was probably the massive herd of impalas we ran across just seconds outside our camp. During our entire morning drive we never saw a single elephant. From seeing hundreds of them the evening before, these 70 thousand elephants are clearly excellent at playing hide and seek. We did however come across two large male lions just a minute or so outside our campground. We parked the truck and waited around for ages just watching the two of them lounge in the morning sun. Finally, one got up and we tried to follow it down the road. We soon got distracted by a pack of blue balled baboons and had to start taking photos. The tiny babies were clinging, like Sarah in a motorbike accident, to their mothers’ stomachs; they were adorable! Then out if nowhere, we saw the lion again, running along side the road. 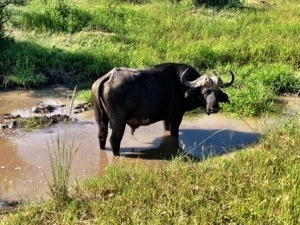 It was being chased away by a full grown buffalo! We started up the jeep and followed the chase as they sped down a small ravine parallel to the road. All of a sudden, the lion sprung up through the trees and onto the road in front of us. We quickly stopped the truck and sat there, in the open air, in a standoff with the lion. The driver shut off the engine, and Sandy jumped on the roof of the truck for a better photo op. For a moment the lion just stared at us; we were all silent. Then, for some reason, perhaps he recognized a human shape on the roof, the lion began to charge at the truck. It took a few bounds toward us, and let out a huge roar, shaking its head. Then just as quickly, it turned and ran back into the brush. It was the most incredible photo taking opportunity we were ever going to get on an African safari! It was exactly what so many of us were silently wishing would happen during the trip. But what does one do when a full grown, male lion charges at your truck, with nothing between you and it except for the open air? You freeze. Many people screamed, jumped the other direction, Sandy nearly flew off the roof, but no one, not a single person in the truck thought, “hmm, I’m going to get a photo of this”. Such a fail. Oh well, attacked by a lion: check! And yet, amazingly, it seems like the dung beetle may have won “favourite moment of the day” award. We spent a good five minutes watching a dung beetle, on the road, rolling a piece of poo three times its size, up a hill. It was strangely incredible. Even plants didn’t get in the way of that little guy! 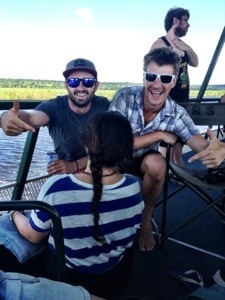 Our stay in Botswana was definitely short, but we had only one day left before the first half of our tour was over. Kelsi and I would be returning to Botswana in three days, but before then we were off to Zimbabwe for more Victoria Falls action. This entry was posted in Africa, Botswana and tagged Chobe, National Park, river cruise, Travel by hilarylust. Bookmark the permalink.